Chaining, or tethering, a pet dog to a stationary object for the purposes of maintaining control of the animal is a highly controversial act. 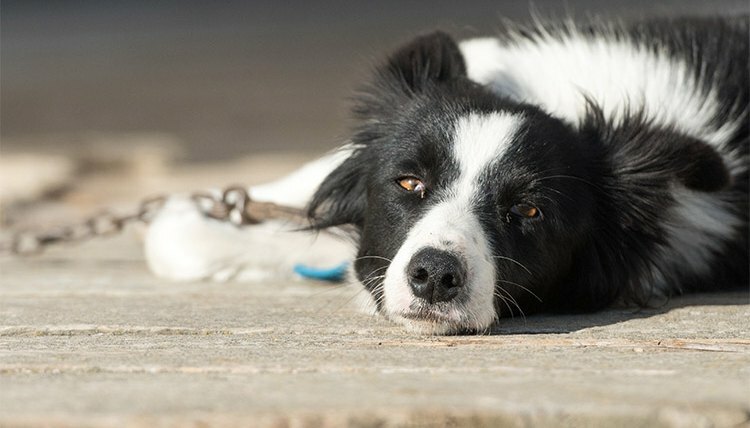 The United States Department of Agriculture (USDA) stands behind the Animal Welfare Act and calls the practice inhumane, and the American Veterinary Medical Association (AVMA) tells pet owners to never chain their dogs. California is one of six states with statewide laws governing dog tethering; many other communities have their own standards. The California law on dog tethering was enacted in 2007 after successful lobbying on the part of animal rights activists concerned about the health and well-being of pet dogs in the state. Continuous chaining of an animal can lead to aggression, depression, malnutrition, anxiety, loneliness and extreme physical discomfort. Because dogs require attention and interaction with their owners and canine friends, they suffer psychologically and physically when this sort of care is withheld. Item (b) of California's Health and Safety Code Division 105, Part 6, Chapter 8 is devoted to "Dog Tethering" and states the following: "No person shall tether, fasten, chain, tie or restrain a dog, or cause a dog to be tethered, fastened, chained, tied or restrained to a dog house, tree, fence or any other stationary object." The document mentions that the law should not be interpreted as a prohibition against walking a dog with a leash. Exceptions in the code state that a dog may be tethered for its own protection while the owner engages in "cultivating agricultural products" or herding livestock or cattle. Owners are permitted to tether for a "reasonable period" while completing a necessary task that requires restraining their dog, and some camping and recreational areas require the temporary tethering of dogs, so obeying their rules does not violate the law. California dogs may also be chained to a "running line, pulley or trolley system" as long as it's not by a choke or pinch collar. If an owner is caught tethering his dog to a stationary object in violation of the law, he is subject to an infraction, a misdemeanor charge or a warning for a first-time violation, with no evidence of physical wounds or damage to the animal. As of 2011, an infraction leads to a fine of up to $250 for each chained dog, while a misdemeanor can result in 6 months or less in county jail, a fine of up to $1,000 or both.